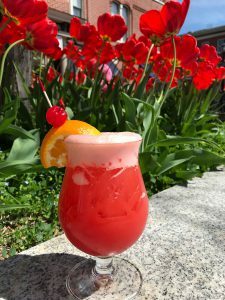 The sun has been shining in Gettysburg and that means it’s time for fruity cocktails! Our master mixologists are sharing our May featured drink – Captain’s Punch. This warm weather inspired libation has us dreaming of the summer days on the horizon. We look forward to welcoming to you to enjoy this cocktail on our outdoor patio. Combine all ingredients in shaker with ice (excluding garnish); shake until combined. Pour all contents in glass of your choice. Garnish with orange slice and cherry and enjoy!